A painting at Seoul's Myeongdong Cathedral shows Vatican's first beatification ceremony for Korean martyrs in 1925 in Rome. A wave of persecutions in the 18th and 19th centuries took the lives of almost 10,000 Catholic followers, considered to be in opposition to the social system of the late Joseon Kingdom (1392-1910). Freedom of religion was granted to Korea's Catholic Church in April 1888, but before that, early church pioneers were subject to brutal oppression. Pope Francis will be recalling their sacrifices and lift them one step closer to sainthood in a historic beatification ceremony in the heart of Seoul, Saturday. It is the first time that Korea's martyrs are being recognized by the Vatican in 30 years since the 1984 papal visit of Pope John Paul II, when he canonized 103 martyrs, including Korea's first priest Andrew Kim Tae-gon. This is a momentous occasion for Korea's Church, which first started in 1997 a meticulous process of getting Vatican's approval for the beatification of Paul Yun Ji-chung and 123 martyrs persecuted more than 200 years ago. These were the earliest pioneers in Korea's Catholic Church in the late 18th and 19th centuries that laid the foundation for a religion that enjoys considerable respect and popularity in today's Korea. Besides encouraging young Catholics across Asia, the pontiff's primary purpose for making a first papal visit to the continent in 15 years is the beatification Mass taking place at Gwanghwamun square. Pope Francis made it clear, during a speech to Korean bishops on the first day of his Korea trip, that he was here to remember the early pioneers of what has become one of the most vibrant Church in Asia. "The beatification of Paul Yun Ji-chung and his companions is an occasion for us to thank the Lord, who from the seeds sown by the martyrs has brought forth an abundant harvest of grace in this land," said the first Jesuit pontiff. "You are the children of the martyrs, heirs to their heroic witness of faith in Christ. You are also heirs to an impressive tradition which began, and largely grew, through the fidelity, perseverance and work of generations of lay persons." Beatification (from Latin beatus, "blessed" and facere, "to make") is a recognition accorded by the Catholic Church of a dead person's entrance into Heaven. Beatification is the third of the four steps in the canonization (pronouncement of sainthood) process. A person who is beatified is in English given the title "Blessed." 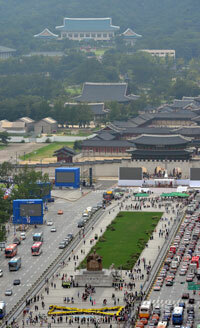 The Gwanhwamun open-air Mass for the martyrs is expected to be one of the largest religious events in the history of the nation, with more than 20,000 expected in the audience. The entire world will catch the ceremony live from their TVs and on the Internet. "It is extremely rare for the Pope to conduct such a ceremony outside the Vatican," said Bishop Yoo Gyeong-chon of a local committee organizing the papal visit. "It is an occasion to remember their spirit, faith and lives." During the Mass, the Pope Francis is recognizing the very first generation of Korea Church founders. The oldest among the list of 124 martyrs is Pius Kim Jin-hu, the great grandfather of Korea's first priest. There are 24 women and 100 men. Many of them are from Seoul and Chungcheong provinces. The youngest of the martyrs is Anastasia Yi Bong-geum, who was only 12 at the time of her execution in 1839. Cardinal Andrew Yeom Soo-jung paid tribute to her ahead of the papal visit. "Among the list of the martyrs that the Holy Father will beatify in Seoul, there is a 12-year-old girl." said Yeom a press center in Seoul, Wednesday. "Korea is the land of martyrs who gave their lives for God. We hope the Korea Church can inspire others on the occasion of the Holy Father's visit." The oldest martyr is Pius Kim Jin-hu, who was 75 at the time of his death. He was born in Solmoe, Myeoncheon, located in the middle of the Naepo plain of South Chungcheong Province. He was the great-grandfather of St. Andrew Kim Dae-geon, and the father of Andrew Kim Jong-han who was martyred in 1816. Zhou Wen-mo from Jiang-nan Province, China. He was one of the first foreign missionaries in Korea. Before his execution, he told the persecutors: "The only reason I came to Korea, despite the dangers I may face, was because I love the Korean people. The teaching of Jesus is not evil." Pope Francis has praised the past and future of the Korea Church, highlighting its expansion in membership and missionary work. "The Church in Korea is esteemed for its role in the spiritual and cultural life of the nation and its strong missionary impulse. From being a land of mission, yours has now become a land of missionaries; and the universal Church continues to benefit from the many priests and religious whom you have sent forth." The Korean clergy has gained more recognition in the Vatican over the years. In 1969, Cardinal Stephen Kim Sou-hwan was named the youngest cardinal in history at age 47. Until his death in 2009, he was the face of the Korean Church and enjoyed much respect in Korean society. Although not a dominantly Catholic country like the Philippines, Korea is one of the few Asian countries that has seen significant growth in the number of believers in recent years. The nation's Catholic population has increased its membership by 70 percent in the past ten years. In 2005, almost 30 percent of Koreans identified themselves as Christian. Most are Protestants, but Catholics are the fastest growing group with around 5.3 million followers -- 10.3 percent of the population. The Korean Church is respected for its unique history in the 2,000-year old Catholic faith. Unlike other countries where missionary priests spread the faith, the nation's church is homegrown. The Church in Korea survived without any formal missionary priests until clergy from France (the Paris Foreign Missions Society) arrived in 1836 for the ministry. The history of Catholicism in Korea began in 1784 when Yi Seung-hun was baptized while in China under the Christian name of Peter. He later returned home with various religious texts and baptized many of his fellow countrymen. Gwanghwamun square in central Seoul is being prepped for the beatification ceremony for 124 Korean Church founders to be led by Pope Francis, Saturday.